This week’s Support Blog is to bring awareness to a situation that could potentially slow things down for our clients. We like it when things run smoothly and your experience is a happy one. However, there are some bumps that happen along the way. Perhaps this will help you to avoid hitting this particular bump along the road of email marketing. Imagine this: You have logged into your Benchmark Email account today in order to upload your new contacts into an existing list. You follow the steps and voilà! Your list is uploaded and ready to use. Except for one very important detail...you have somehow managed to upload the names into your “Master Unsubscribe List” by mistake. Don’t feel bad. This has happened many times in the past and there is a way of fixing the error. It is just very time consuming and can be avoided altogether. On Step 1 of Add Contacts to Lists, you will see the following screen. This is where you will select which of your existing lists you want the new contacts to go into. 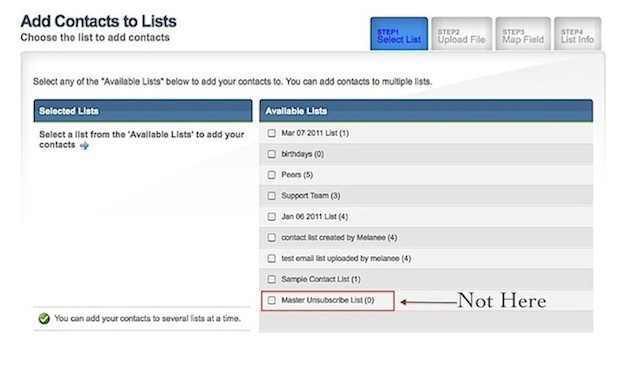 It is important that you do not select the box for the “Master Unsubscribe List” if these new contacts are active subscribers. The only time you would need to upload contacts into the Master Unsubscribe List is when you actually have a list of users you do not want to contact. Once an email address is added to this list, you do not have the ability to remove them. That has to be done by us here at Benchmark Email. If you have accidentally added your contacts to the Master Unsubscribe List, please contact us as soon as possible so that we can start the process of removing those contacts for you. The best way would be to email us at support@benchmarkemail.com and provide a list of all of the contacts that need to be removed from the list. You may also contact us via live chat or you can call in. Once we have removed those subscribers, you will then be able to add them to the correct list.